Sterling Publishing (NY), 9781402797057, 304pp. 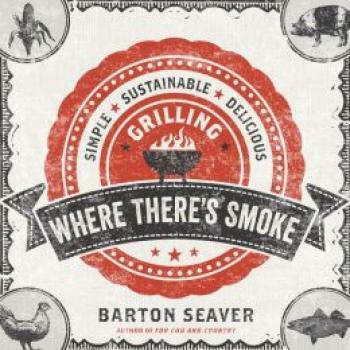 This second cookbook from Barton Seaver--following For Cod and Country--sends the rising authority on sustainable foods to the sweet, smoky grill, where he showcases his love of fresh, organic produce, fish, beef, and poultry. Emphasizing seasonal vegetables and accompaniments as much as the protein, Seaver serves up recipes designed to celebrate the spirit of togetherness--including Wood-Grilled Snap Peas with Smoky Aioli, Grilled Pacific Halibut with Pistachio Butter, Peruvian Chicken, Chimichurri Marinated Short Ribs, and Pickled Smoked Peaches. In addition to mouthwatering dishes, Seaver gives the nitty-gritty on fueling your fire; preparation and cooking; recipes for sauces, spice mixes, and marinades; and ways to eat smartly and healthily. After leading some of the top restaurants in Washington, DC, Barton Seaver now focuses his knowledge and experience to link seafood to broader socioeconomic, ecological, health, and cultural issues. Lauded as a leader in sustainability by Seafood Choices Alliance, Seaver was named a Fellow with the National Geographic Society and works with their Ocean Initiative program to demonstrate that the choices we make for dinner have a direct impact on the ocean and its fragile ecosystems. As a board member, Seaver works closely with Harvard's Center for Health and the Global Environment to bring together Boston-area hospitals and health-care providers with healthier and more sustainable food service opportunities. Learn more about him at bartonseaver.org.